"It all started with teaching people how to use FileMaker's ScriptMaker, hence the name Scriptology. The rest is evolution." If you're searching for instructional templates, tools and resources about the FileMaker platform, then you've landed on the right page. 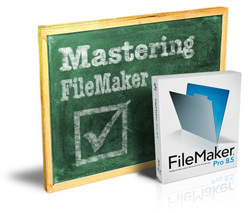 This web site focuses on content for any level of FileMaker Pro user. This includes beginner, intermediate and advanced developers. No matter what your level, you'll likely find useful FileMaker related content at this site. The following is a listing of the products we currently offer - all about learning and using the FileMaker platform. The Scriptology Theme Library is an invaluable tool for any FileMaker user, or developer, who desires high-quality layouts for their solution. This tool is Layout Mode's best friend - especially for the creatively challenged or developer who is short of time. In this product you'll receive content full of useful graphic elements, color suggestions, fully designed layouts and other helpful layout-based tools which provide a quick path from a so-so layout to an attractive professional look. The template file provides easy navigation and covers the finer details of becoming a professional FileMaker layout designer. Designed by well-known FileMaker developer Matt Petrowsky, this package will advance any FileMaker developer to a greater level of understanding about how Layout Mode can be optimized and how to achieve the best look for your FileMaker solution. Manage what users can do (and can't) - better! The Scriptology Permissions Template was designed for one purpose - to significantly extend what FileMaker Pro already provides. This template does not work around or jeopardize your FileMaker security, instead it adds the ability to manage what users can and can't do by adding support for groups of users and providing an extreemly simply, but very powerful, administrative interface. FileMaker's native Privilege Sets are an all-or-nothing answer to what groups of users can do, why not make things easier? Using one single Perform Script script step (within any script that requires permissions), you gain a great degree of control over how your users will interact with your database. Whether you're using FileMaker for a simple small business solution, providing a shrink-wrapped FileMaker solution or managing hundreds of users in a work group database, this template will provide you with the knowledge and tools to successfully manage permissions within your solution. © Copyright 2011 - ISO Productions, Inc.